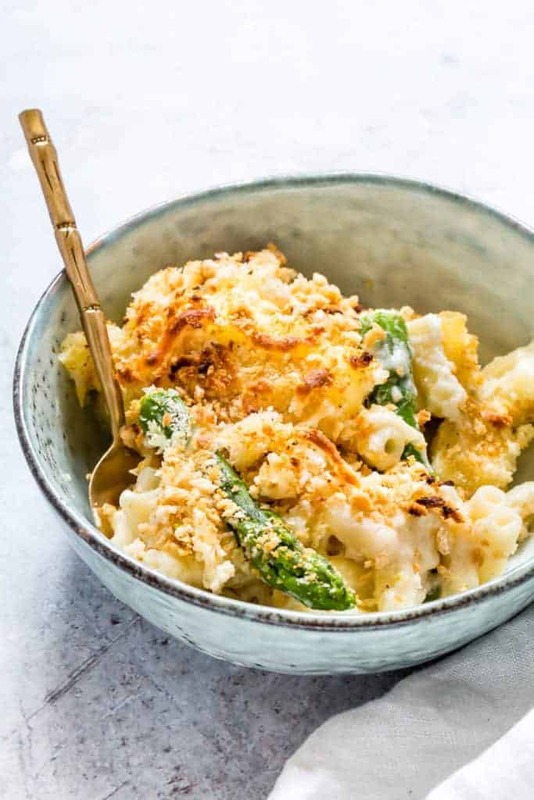 This Asparagus Mac and Cheese recipe is the perfect recipe for those days when you just want something simple (but soooo good). 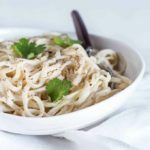 It is made with everyday ingredients, vegetarian and a great comfort meal! 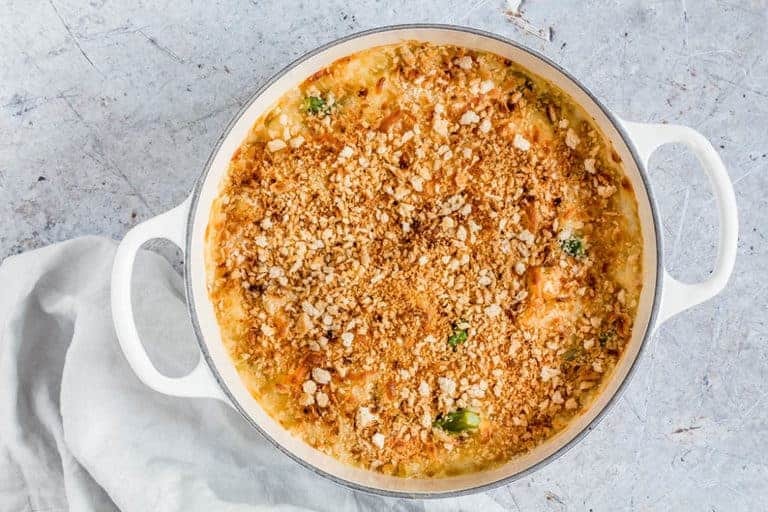 And kicking off asparagus love with this warm and comforting baked asparagus macaroni cheese recipe. Yeap, asparagus + macaroni + cheese + crunchy breadcrumbs = match made in foodie heaven. It is easy – aka cook your asparagus along with your pasta, make your creamy cheesy sauce (oh yes please), put it together and bake. That’s it. The lush crunchy golden breadcrumb toping – totally optional but adds that extra wow factor. You can prepare it ahead of time, freeze or refrigerate it and bake it just when you need it. It has asparagus in it. Oh yes, oh yes, oh yes. I make this dish a lot during asparagus season. Mostly thanks to my amazing MIL, who kindly leaves us weekly asparagus parcels outside the front door. It never fails to bring a smile to my face when I come back from a long day away to a basket full of locally grown, freshly picked asparagus. This translates to asparagus shakshuka, asparagus risotto, mushroom and asparagus pasta and of course asparagus mac and cheese. 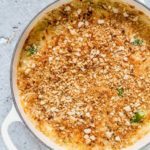 In the meantime, I will leave you with my rather perfectly crunchy topped asparagus macaroni cheese recipe. Please do try it and if you do make it then please do tag me on InstagramInstagram or twitter so that I can pop over and have a look. It is really really awesome for me when you make any one of my recipes. 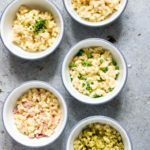 Also if you do like mac and cheese then you should check out this slow cooker mac & cheese UK recipe from My Fussy Eater. So, so good. For other comfort food recipes why not try this gluten free Fish Pie? Don't forget to tag #recipesfromapantry on Instagram or Twitter if you try Asparagus macaroni cheese recipe! It is really, really awesome for me when you make one of my recipes and I'd love to see it. You can also share it on my Facebook page. Please pin this recipe to Pinterest too! Thank you for reading Recipes from a Pantry. Preheat the oven to fan-assisted 160C / 180C / 350F / gas 4. Cook the macaroni according to the packet instructions till al dente. About 3 mins before the macaroni is done add the asparagus. When done drain, transfer into the baking dish. Melt the butter in a pot over medium heat before adding in the flour and mixing to form a roux paste. Cook for a couple of mins. Then slowly whisk in the warm milk a little bit at a time till the milk is all in and you end up with a smooth creamy sauce. Simmer this sauce for about 8 mins till it thickens before stirring in the nutmeg, cheddar and mozzarella cheese until the cheese is all melted. Pour the cheese sauce over the asparagus and pasta mix till everything is well coated, top with breadcrumbs, cover with some foil and bake for 30 mins. Take the foil of during the last 10 mins of baking so that the breadcrumbs get even more golden. That is one standout “grown-up” mac and cheese! 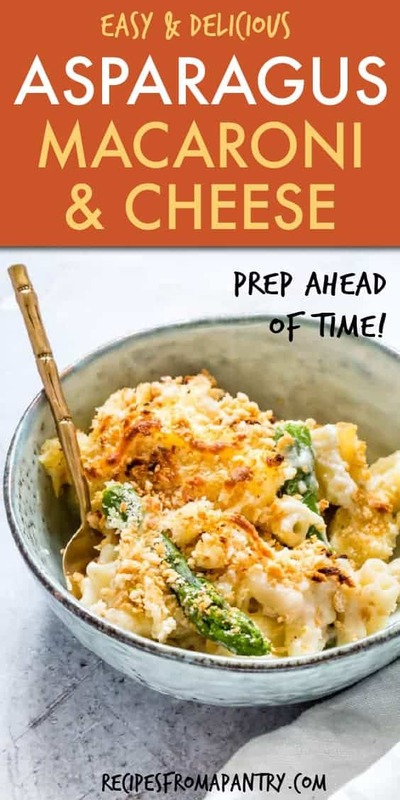 I’ve never thought of adding asparagus to macaroni cheese, but this looks fantastic. 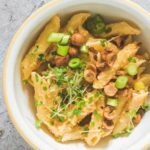 What a great way to add some extra veggies to your mac. Love all the breadcrumbs on top, yum! 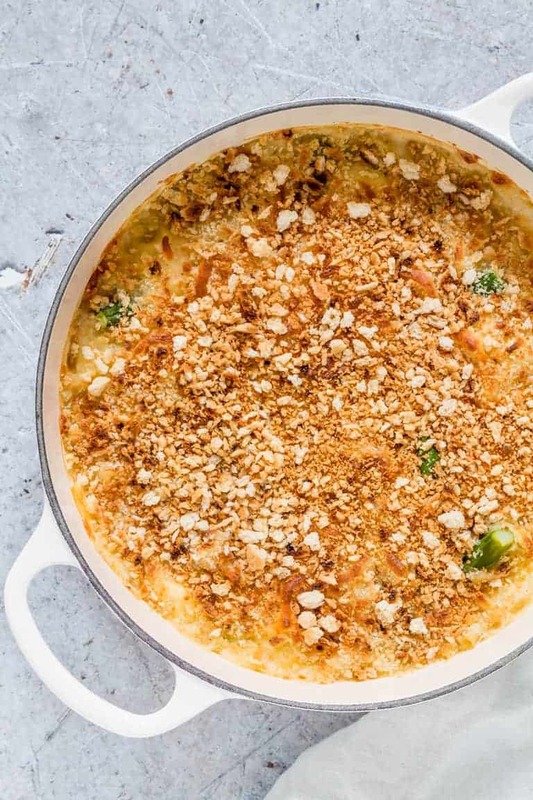 This mac and cheese sounds like perfect comfort food! Love the addition of asparagus! Wow, I didn’t realize Expedia did that! So cool! Checking out the food festivals would be right up my alley! 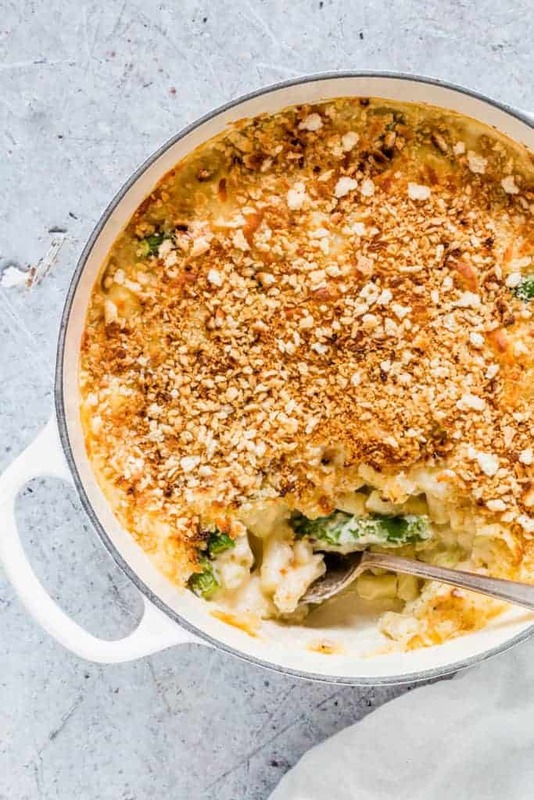 This asparagus macaroni cheese is genius! Great tip for cooking the asparagus and the macaroni together in the same pot! Time saver and less pots to clean – haha!! Looks so delicious! YES to creamy cheese sauce, and yes, Yes, YES to asparagus—especially the gorgeous stuff I’ve been seeing at the Farmers’ Market. And how perfect that this can be frozen to be enjoyed later! There’s nothing I love better than a casserole full of melty goodness that is all ready to go into the oven after work. 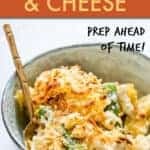 What a great way to add some nutrition to your mac n cheese! This looks delicious! And what a great way to sneak in some vegetables! I love a homemade mac and cheese but I’ve never had the pleasure of enjoying asparagus hidden inside the dish. This sounds tasty and right up my alley. Oh my word! 2 of my favorite ingredients married! It looks so creamy and crunchy at the same time! Lucky girl to have an MIL with an abundance of asparagus! this looks like comfort food at its best. I would love to dig into it! I was JUST thinking this would make a great meal ~ you beat me to it! I’m going to try it this week, it looks beautiful! 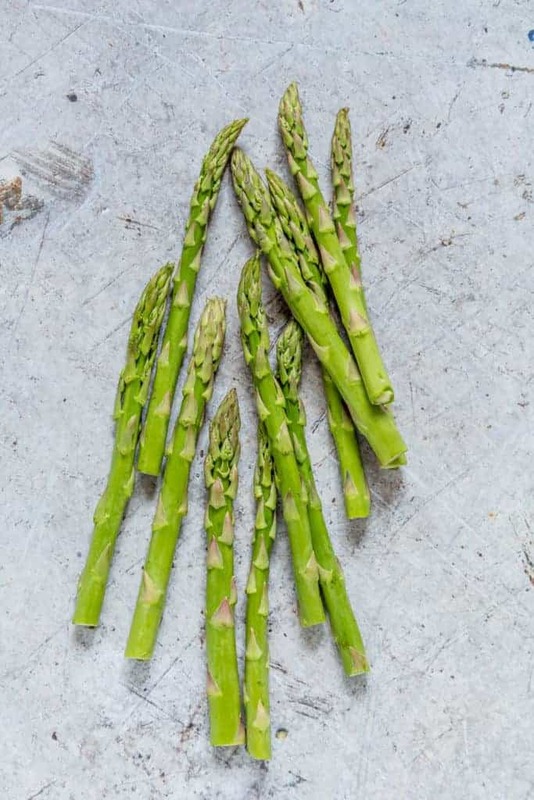 Yum…love asparagus. I have never paired it with pasta. Looks like the perfect comfort food to me.